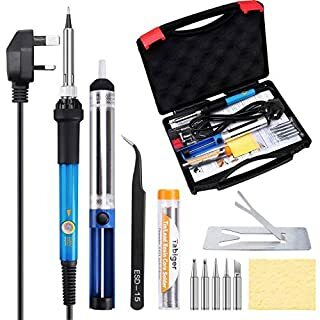 YTE Adjustable Temperature -Welding Soldering Iron Electric Soldering Iron Gun Kits are Designed for DIYER,Beginner,Engineer and all of whom Love DIY and Create the Magic in the Life .Widely Used in Your LifeBest gift for DIYER, various repaired usage of electronics and chip boards, jewelry, welding, wiring, mobile device, computers hardware, small electronic work etc.WE PROMISE: Lifetime FULL MONEY REFUND Warranty, and Any questions you have, please don't hesitate to contact us. We will get you back within 24 hours. 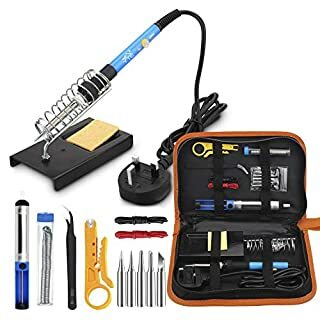 Package : 1 x 220V 60W Adjustable Temperature Welding Iron from 200℃ to 450℃ 1 x Desoldering Pump: plastic and aluminum alloy 5 x Different Soldering Iron Tips : 900M series 1 x Tin Wire Tube 1 x Soldering Iron Stand 1 x Tweezers 1 x Wire Stripper Cutter 2 x 22 AWG Electronic Wire (red & black) 1 X PU Tool Carry Bag Notes: 1. When you receive the product, please check whether there is fragment or hit sound or not. If yes, please kindly contact us to get a new one, in order to avoid short-circuit or other safety problems. 2. The iron heats up fast, so please select a suitable temperature. Working for long hours and high temperature may shorten its life. 3. Do not allow the iron to idle at operating temperatures for extended periods, this could burn the soldering iron and even other things. 4. Impurities in the metals are very easy to become oxide in the process of soldering. And these oxides will reduce working efficiency of soldering iron tip which won't stick to tin. 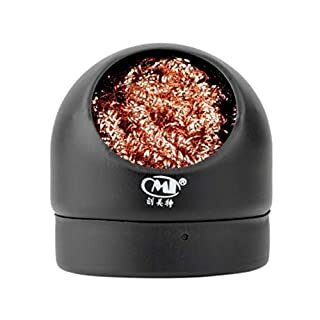 When cleaning, first adjust the temperature of the soldering iron to about 250 ° C, then clean the tip with a cleaning sponge, and then apply tin. Repeat the action until the oxide is cleaned. Advantage1:The soldering iron kit comes with power switch button and temperature adjustment button, so It can be freely and easily to turn on/off or adjust the temperature that you need.2:Made of Japan KYOCERA precision printing technology and the solder kit can be sintered at high temperature and keep a long time use.3:If you want to learn how to solder, this soldering iron starter kit is perfect for your need. 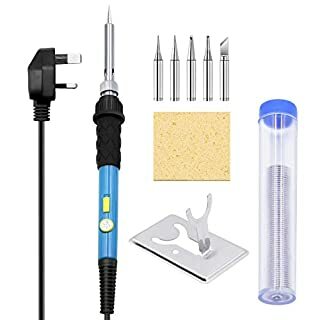 It's very convenient and compact.4:Non-slip soft rubber handle for maximum comfort and safe soldering.SpecificationsSoldering Iron Length: 7.0 InCable Length: 57.5 InWorking Voltage: 220VPower: 60WPackage Included1 x Temperature Adjust Soldering Iron5 x Soldering Iron Tips1 x Y-style Stainless Steel Soldering Stand1 x Solder Wire1 x Yellow Sponge PadWarm Tips1:Please be careful when you are using the tools in case of pricks or other injuries.2:The iron heats up fast, so please select a suitable temperature. Working for long hours and high temperature may shorten its life.3:Do not use near flammable materials. 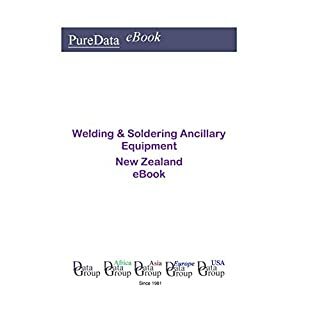 The Welding & Soldering Ancillary Equipment New Zealand eBook provides 14 years Historic and Forecast data on the market for each of the 48 Products and Markets covered. The Products and Markets covered (Welding & soldering ancillary equipment) are classified by the Major Products and then further defined and analysed by each subsidiary Product or Market Sector. 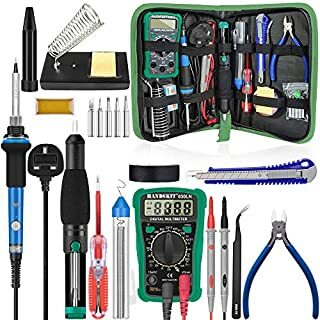 In addition full Financial Data (188 items: Historic and Forecast Balance Sheet, Financial Margins and Ratios) Data is provided, as well as Industry Data (59 items) for New Zealand.WELDING + SOLDERING ANCILLARY EQUIPMENT1. Welding & soldering ancillary equipment2. Accessories & equipment for spot & resistance welding machines3. Benches, welding4. Bladders, pipe purge, metal welding5. Blowpipes, metal cutting6. Blowpipes, metal welding7. Blowpipes, preheating, metalworking8. Cleaning tools for blowpipe nozzle tips9. Contact tips, metal inert gas (MIG) welding10. Contactors, metal welding machine11. Control & regulation equipment, automatic, for spot welding12. Cooling systems for welding & brazing equipment13. Driers for welding electrodes14. Drives for welding machines15. Earthing clamps, rotating, metal welding16. Earthing couplings, rotating, metal welding17. Electrode dressing tools, resistance welding18. Electrode holders, welding19. Electrode pressure measuring devices, resistance welding20. Electrode vapour & fume exhausters for arc welding machines21. Extractors, vapour, portable, metal welding22. Flux feed & recovery units, metal welding23. Flux ovens24. Gas economisers, metal welding25. Grinding machines for welding electrodes26. Hose reels, welding27. Manipulators & positioners, metal welding28. Monitors, automatic, resistance welding quality control29. Nozzles, blowpipe, metal welding30. Pressure reducers, oxyacetylene, metal welding31. Safety valves & quick connectors for oxygen & acetylene hoses, metal welding32. Spools for welding wire33. Spot welding guns & controls, pneumatic, hydraulic34. Supports, metal welding35. Thermic lances36. Transfer equipment, automatic, for welding machines37. Transformer cores, metal welding machine38. Turntables, welders39. Weld monitoring & alarm systems, continuous40. Weld monitoring & analysing equipment41. Welding blankets, surface protective, glass fibre42. Welding booms43. Welding booths & screens/curtains44. Welding clamps for pipes45. Welding enclosures, flexible plastic46. Welding platens47. Wire feed units, soldering & brazing48. Welding & soldering ancillary equipment, NSKThere are 188 Financial items covered, including: Total Sales, Pre-tax Profit, Interest Paid, Non-trading Income, Operating Profit, Depreciation, Trading Profit, Assets (Intangible, Intermediate + Fixed), Capital Expenditure, Retirements, Stocks, Total Stocks / Inventory, Debtors, Maintenance Costs, Services Purchased, Current Assets, Total Assets, Creditors, Loans, Current Liabilities, Net Assets / Capital Employed, Shareholders Funds, Employees, Process Costs, Total Input Supplies / Materials + Energy Costs, Employees Remunerations, Sub Contractors, Rental & Leasing, Maintenance, Communication, Expenses, Sales Costs + Expenses, Premises, Handling + Physical Costs, Distribution Costs, Advertising Costs, Product Costs, Customer + After-Sales Costs, Marketing Costs, New Technology + Production, R + D Expenditure, Operational Costs. /.. etc. WE PROMISE: Lifetime FULL MONEY REFUND Warranty, and Any questions you have, please don't hesitate to contact us. We will get you back within 24hours. 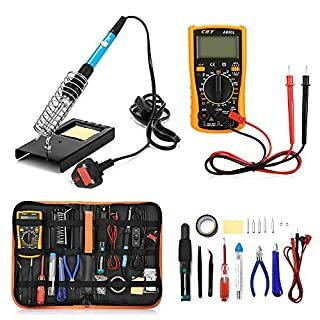 Package Specifications: 1x 220V 60W Adjustable Temperature soldering Iron from 200-450℃ 5x Soldering Iron Tips 1x Digital Multimeter & Instructions of Multimeter 1x Desoldering Pump 1x Anti-Static Tweezers 1x Screwdrivers 1x Soldering Iron Stand 1x Tin Wire Tube 1x PU Carry Bag 1x User ManualWarm Tips: Please be really careful when you are using the tools in case pricks or other injuries. The iron heats up fast, so please select a suitable temperature. Not recommend to work in a high temperature for a long time. Impurities in the metals are very easy to become oxidations in the process of soldering. And these oxidations will reduce soldering iron tip working efficiency so that requires more professional cleaning. Otherwise, Solder tip will not stick to tin. 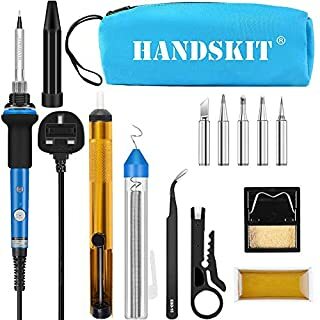 Please be careful to clean the soldering iron tip.Warranty All items purchased from HANDSKIT are ensured with a top quality and you can enjoy the 24-hour friendly customer service via email FOR 30 days. 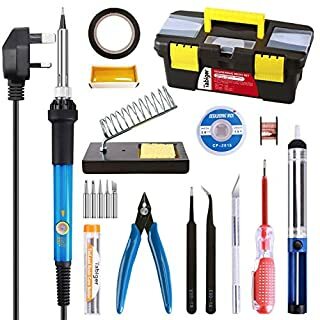 Package Specifications:1 x 220V 60W Adjustable Temperature soldering Iron from 200-450℃5 x Different Soldering Iron Tips1 x Desoldering Pump (Plastic and Aluminum Alloy)1 x Anti-Static Tweezers (ESD-15)1 x Screwdrivers1 x Soldering Iron Stand1 x Wire Stripper Cutter1 x Electronic Wire1 x Tin Wire Tube1 x Carry Bag1 x User ManualHow to solder: Prepare solder and soldering iron; It's necessary to keep the tip clean. Please wet the sponge before using. When the temperature is high enough, put the solder wire close to the joint, the solder will melt and flow freely.Please remove the solder wire when the tin is enough. Take away the soldering iron in a direction approximately 45°and power off. 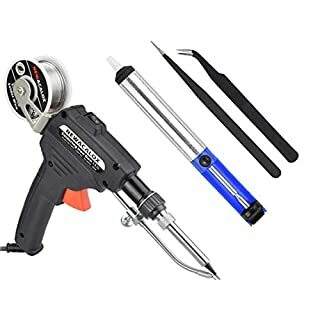 Don't pull the soldering iron tip outward and use it in that way, which will shorten the heating element life.Notes: Please be really careful when you are using the tools in avoidance of pricks or other injuries. The iron heats up fast, so please select a suitable temperature. Working for long hours and high temperature may shorten its life. Do not allow the iron to idle at operating temperatures for extended periods, This could burn the soldering iron and even other things. Impurities in the metals are very easy to become oxidations in the process of soldering. And these oxidations will reduce soldering iron tip working efficiency so that requires more professional cleaning. Otherwise, Solder tip will not stick to tin. Please be careful to clean the soldering iron tip. If you do not know how to operate the soldering iron tool, please operate under the guidance of the Professional!